Frank Lobdell, born in 1921 in Kansas City, was an American painter, often associated with the Bay Area Figurative Movement and Bay Area Abstract Expressionism. His artworks are a part of several public collections, e.g. the Achenbach Foundation for the Graphic Arts, San Francisco, CA; Albright-Knox Art Gallery, Buffalo, NY; American Academy and Institute of Arts and Letters, New York, NY. Frank Lobdell attended St. Paul School of Fine Arts, St. Paul, MN, before studying at California School of Fine Arts (now the San Francisco Art Institute), and at Académie de la Grande Chaumière, Paris, France in the beginning of the 50’s. He taught at the California School of Fine Arts from 1957 to 1965, and at Stanford University, Stanford, CA for 25 years, from 1966 until 1991. 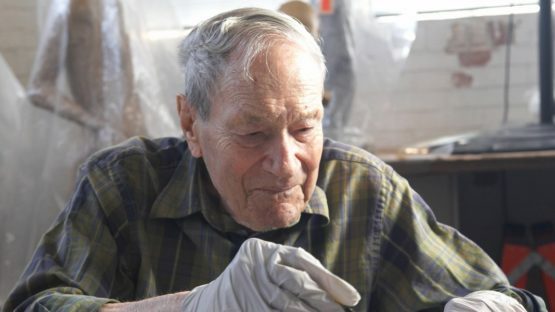 He participated in the World War II, and witnessed the horrors of a conflict. He even wasn’t sure if the art had its place in a world in which such crimes and atrocities can happen. Lobdell started as an abstract expressionist in the 40’s, and in the 50’s he started reintroducing the human figure into his pieces. The scale and scope of the figures were expanding, as their humanity was opposing the war in Vietnam in the 60’s and the 70’s. Since the 80’s, his work clearly showed the search for the deeper meaning of life, in both the artist himself and all of the humankind. In a way, Lobdell tried to save the humanity from itself, emphasizing the artistic nature in people rather than that ever-present need for confrontation. Frank Lobdell lived and worked in San Francisco.